Aug. 30: moved with Section back to the 14th S.M.O. Batn. For this next show, which I suppose will be the invasion of Italy. Sept. 1: Everything is ready to move to Riposto, just east of Mt. Etna. The wheels will move off at 2 a.m. Tomorrow and all my section will go with them, with the exception of myself – Jeep, Slim, I and chief, with Coyle on motorcycle. 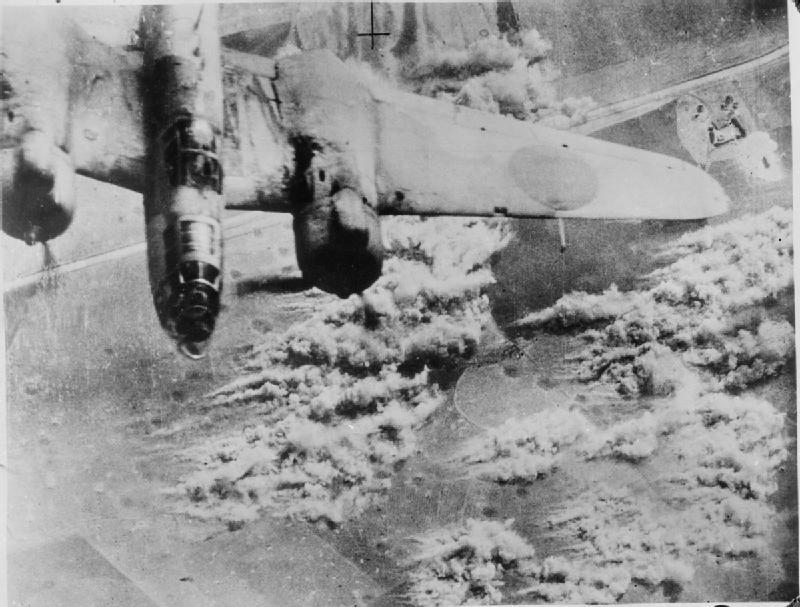 A Martin Baltimore of theTactical Bomber Force of the North West African Air Forces, flies over its target by a road in Sicily, while bombing retreating German forces heading for Messina. IWM (C3772). en route to Africa. His game knee has gone bad again. Still no mail. We bought a pig and ate it today. It was grand. Aug. 25: Another very hot day – malaria is about holding it’s own. Dysentery is on the decline. Reports today show that the 1st. Can. Div. Is taking a beating from Malaria as well as several English units in our vicinity. An Italian orchestra from Catania played on our grounds last night – very good too. They closed the evening by playing “God Save the King.” The flies are terrible. 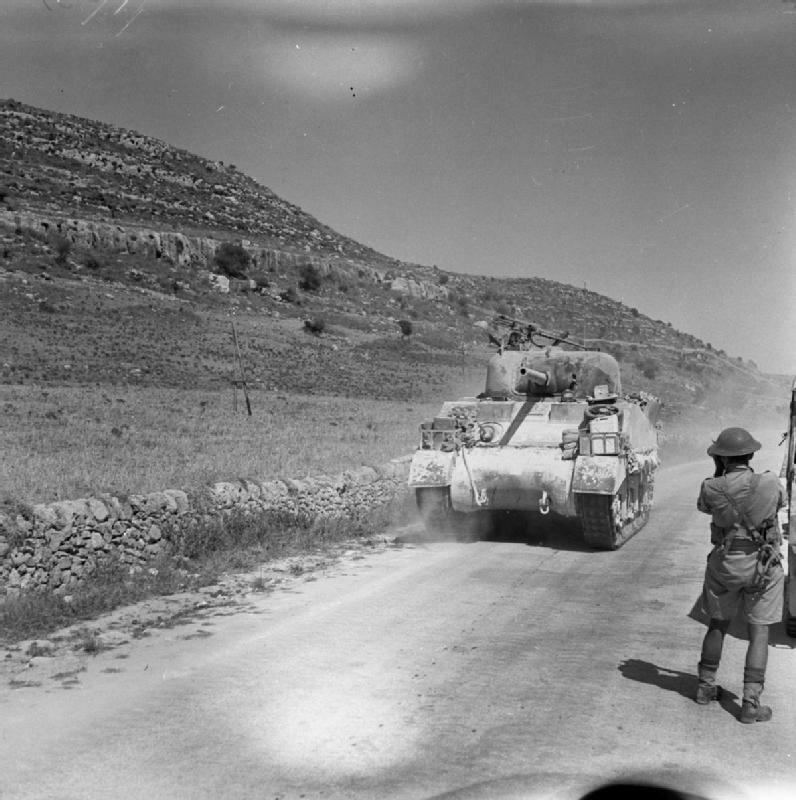 A member of the AFPU photographs a Sherman tank passing along a road, 12 July 1943. Both Bruce and Stoney returned to the Unit today. I am still running the O.R., Malaria, Dysentry and minor work – one hundred and fifty cases today. Finish on that tomorrow and start in the MDS for a week – will be very busy for next week also. Expect to take a Section and cover the Calgary Reg. in the assault wave of the next show. Don’t know just when it will start, or where it will be, but expect it will be soon. Very little mail yet. 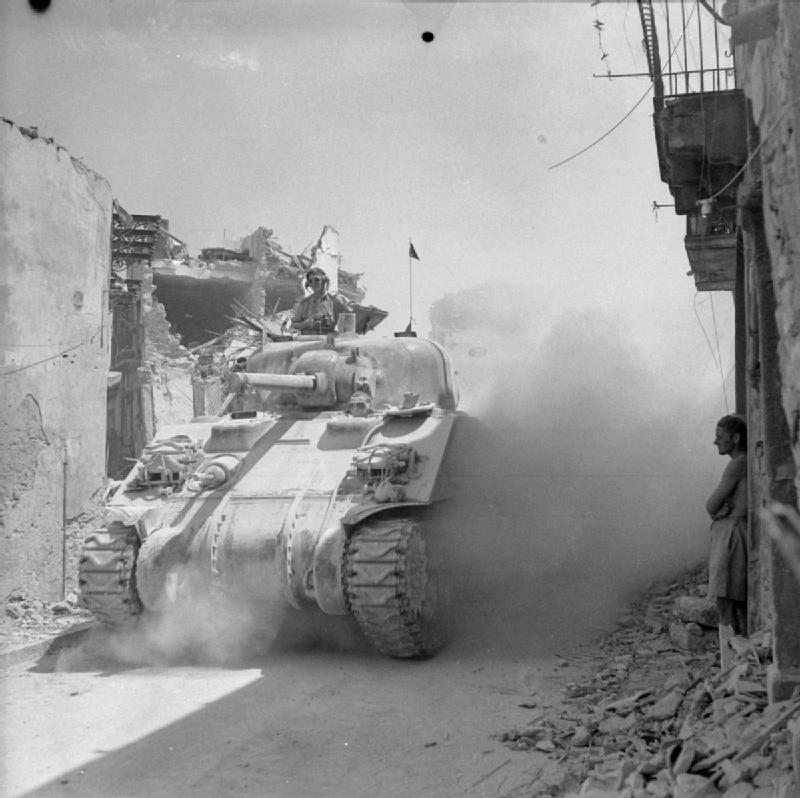 The Drive for Messina 10 July – 17 August 1943: A Canadian Sherman tank passes through a bomb scarred street in Regalbuto. Poop left today – both he and Stoney spent the night with me. Poop was blown up in a mine about two days ago – his hearing is very bad. Tonight Stoney, Bruce Trotter, Ralph and I went up to a memorial service at the Calgary Regiment, Dieppe. Capt. Costigan put on a grand service – Capt. Smith read the lesson. About ninety-five men and eight officers were present who had been to Dieppe. 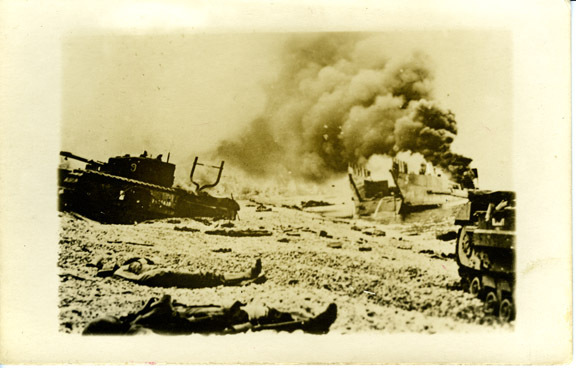 TLC 5 burns following the Dieppe Raid of Aug. 19, 1942 flanked by a pair of Churchill tanks of the Calgary Tank Regiment. The bodies of a Canadian and a U.S. Army ranger lie on the beach. Rob Alexander collection. Aug. 12: last night we had a very heavy air raid. An ammunition dump blew up and burned for hours. It was very pretty but a little close. Today I went to Scordia and met a Captain who was an inspector for Scotland Yard. He showed me through the Typhoid Hospital he had opened. A most remarkable chap. 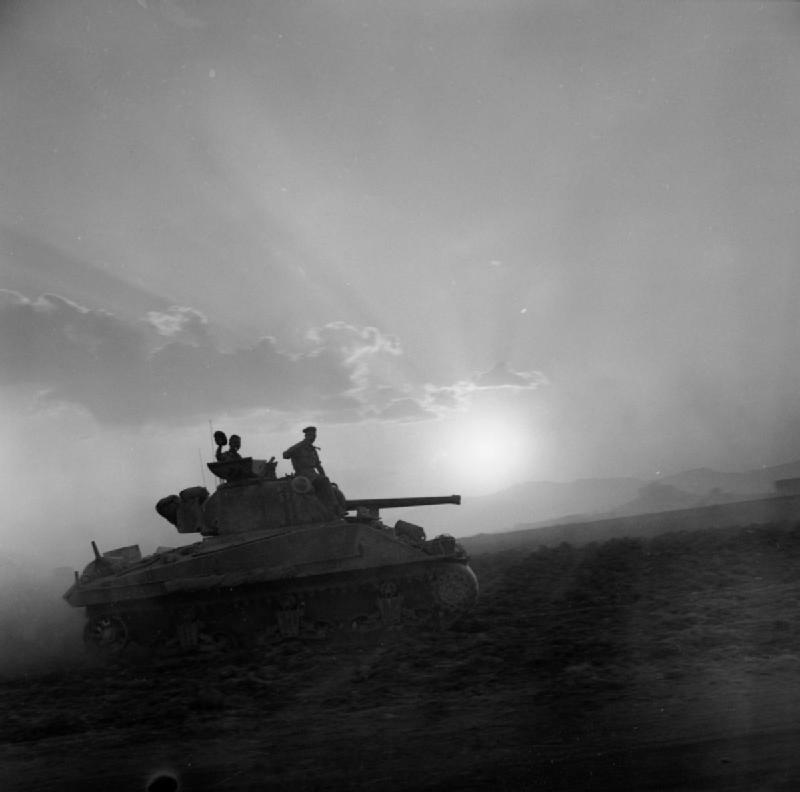 Later on we went to a tank bridge laying and Scorpion Tank mine exploding demonstration. Two days of my punishment over. Still behaving. Aug. 15: Went on a Unit sight seeing tour. Two jeep loads and two truck loads. Went from billets north of Scordia to Palagonai, then to Caltagirone, north to Piazza Armerina, then north to Enna, which sits as a citadel on top of a very high rocky hill, then east to Leonforte, then east to Agira – a city built on a dome like hill then to Regalbuto a few miles west of Mt. Etna – then straight south to Palagonia and back to billets. Really a terribly rugged, barren country, with hair pin bends as roads. Aug. 16: Started running a hospital and taking Brigade sick parades on admitting. Am terribly busy – Malaria and Dysentery to an alarming figure. Aug. 17-18: Working terribly hard, Malaria and Dysentery almost swamping us – but believe we can handle it. Aug. 5: George Dodds and I drove to Syracusa in Scout Car. Visited the Cave where Daniel was thrown to the lions. Saw their old pens which are now being used as air raid shelters – then visited the old Cathedral built at the same time. Took Dodd’s confession from Confession Box and annointted him with Holy Water. Discovered that the 5th Can. Gen. Hosp. Were on the hill in Syracusa so went up to visit Marj. Florendine. We had a lovely chat for about 1/2 hour – then we returned to Catania Plains. News just received that Catonia has fallen today. The part of Sicily still held by the Germans is slowly but steadily dwindling. Italy next, and before long at that. Bert and Jim are forward with me now with the 15cwt ambulance. Aug. 7: Jimmy Edmunds, Poop, Wells and drive were blow up in a jeep yesterday. Jimmy is badly wounded and in hospital. Poop has a punctured ear drum. We are moving back to A Echelon today, all three Echelons will be together again. Aug. 8: Made a statement that I have never seen morale of the Unit as low – a statement which is true. The Col. did not believe me and instead of investigating, as he should – fired me from the Unit. I went before the Brigadier who sent me to Field Ambulance for a month – then to be returned to the Unit. Aug. 11: Ralph and I have arrived at 2nd Field Ambulance. I loathe and despise it.